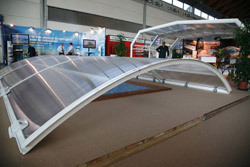 SUN, the 26th International Exhibition of Outdoor Products. 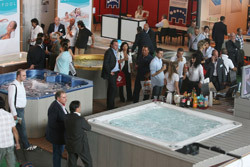 Design Furnishing, Accessories will take place on October 16-19, 2008 at the Rimini Expo Center. 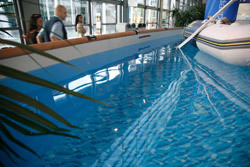 In this occasion, EuroSpaPoolnews will publish a Special Italy edition of “LE JUSTE LIEN”, which 4000 copies will be distributed for free to the exhibitors and visitors. SUN is an international reference show for professionals in the Outdoor sector, a unique event that once again looks at the future: the 26th edition will provide a comprehensive preview of the summer 2009 collections, including trendy objects, fusion ambiances, and material evolutions; it will anticipate styles and directions and showcase projects and design, testing, innovation, and evolutionary processes in the outdoor products’ sector. With 12 halls and a 90,000 sq. m. exhibiting surface, 700 exhibitors and 24,000 professional visitors from 50 foreign Countries, SUN is the only exhibiting event entirely dedicated to public and private outdoor space design and furnishing. These numbers describe a new collective imagery focused on pleasure and on the freedom of outdoor living, beyond places, beyond seasons, beyond walls, deep into a space of lines and forms that give life to a very peculiar sensory workshop. An outstanding opportunity for architects, designers, landscape architects, and furnishers to meet and confront, SUN is a great showcase where style and emotion, design and colour, innovation and enchantment outline a preview of future outdoor living, of the freedom to choose and to move In_ and Out_door. SUN is the widest display of fluid housing, where ‘out’ is an extension that relates, melts, and confronts with indoor spaces, adding to their charm, design, and comfort. SUN 2008 will include a number of shows, debates, and events focused on the topic selected for its 26th edition: ‘LIGHT and WATER’. The magic of these natural and vital elements, their charm and mystery, their endless opportunities to create atmospheres and arouse emotions will provide a background for unusual and seductive ambiances that turn into a unique setting enriched with emotional setups, on the wake of highly refined inside-out living. Again SUN 2008 will act as a privileged interpreter of the aesthetic languages of new life styles and as a forerunner of space versatility, identifying the signs, dreams, and symbols of a boundless design conceived to inhabit open-air spaces.